BMI or Body Mass Index is the simplest way of measuring obesity, but more and more researchers are questioning its accuracy and usefulness. BMI was supposed to estimate a person's degree of obesity based on a simple formula: weight in kg/height in meter2. BMI reading of <18.5 meant a person is underweight and needs to gain weight, 18.5 to 22.5 meant normal, a value between 23 to 25 was considered overweight, while the one above 25 was considered obese and definitely had to lose weight. But, today more and more researchers agree to the fact that BMI is not the best indicator of health. BMI takes into account only the height and weight of the person, and fails to take into account the lean muscle and fat percentages in the body. This can often be misleading, especially when measuring a person with higher muscle mass and lower body fat, he may be unnecessarily deemed as unhealthy, whereas a person with higher body fat, but low muscle mass and BMI may end up being termed healthy. It is also inaccurate because it doesn't take into account the age, gender, ethnicity and fat distribution of a person. Muscle mass is seen to decrease as the person ages, so if a 65 year old has low weight and BMI, it does not necessarily mean he is healthy. Another important thing to note is fat distribution, an important indicator of health risk than weight, which is not considered in the BMI formula. Each and every person stores fat differently and there is increasing evidence that proves that people who store more fat near their waist are prone to metabolic diseases like heart disease, insulin resistance and diabetes. It is also seen that people from South Asian descent tend to have more fat as compared to the Caucasians. 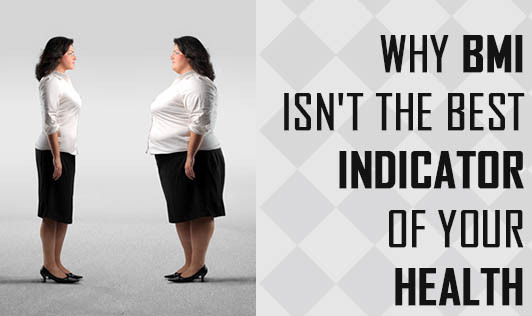 So even if their weight and BMI is normal, they are still at a higher risk to develop metabolic diseases. So don't just assess your health based on your BMI, combine it with other important measures like waist circumference and hip circumference for a better analysis of your health.